← Happy Thank Your Mentor Day! 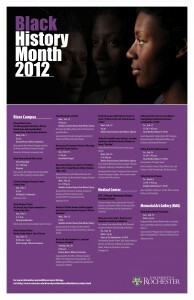 There are many events happening at the University and in the greater Rochester Community for Black History Month. SBAI has two special events to commemorate the month, as well as updated website images! Visit our website to see this month’s featured individuals, including Michelle Gordon, Assistant Professor of English at the University of Southern California, who will give this year’s Two Icons Lecture. Our first event for the month will be a research seminar with Takkara Brunson, post-doctoral fellow at the Frederick Douglass Institute for African and African-American Studies. Brunson will present her work “Remnants of Slavery on the Eve of Independence: Afro-Cuban Women Define Freedom, 1886-1900” on Wednesday, February 22 at 12pm in Lattimore 540. Lunch will be provided, so please RSVP to sbai@rochester.edu by February 20. We hope you join us again the following week for the Two Icons Lecture. This annual lecture examines the intersection of race and gender, and honors the legacy of Susan B. Anthony and Frederick Douglass. Michelle Gordon will give her lecture “‘Baby, You Could Be Jesus in Drag’: Lorraine Hansberry and Black Domestic Workers on Being The Help” on Wednesday, February 29 at 5pm in the Welles-Brown Room of the Rush Rhees Library. The event is co-sponsored by SBAI and the Frederick Douglass Institute. Directly before the lecture at 4pm will be a panel discussion “A Raisin in the Sun: From Domestic to Epic” lead by Professor Steven R. Carter. 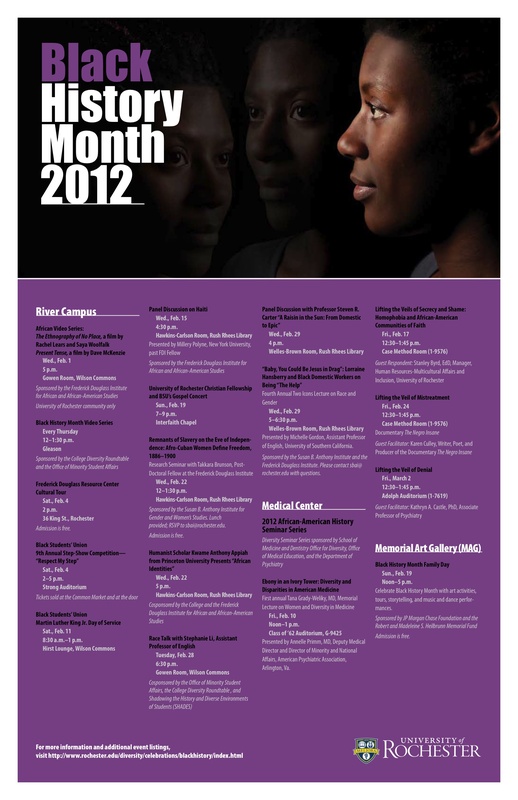 Don’t forget to check back at the blog for more Black History Month highlights! This entry was posted in College Events, SBAI Events, UR Events and tagged #Black History Month, #research, #Two Icons. Bookmark the permalink.